Essentially, this is whole bean soy, shaped and dehydrated. In practice though it’s so much more. 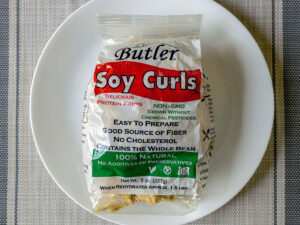 These soy curls are a fabulous meat substitute that are pocket friendly, flexible, healthy and possess a wonderfully chewy meat texture. It’s worth underscoring how versatile this product is, seasoned correctly it lends itself in everything from soups to tacos to pizza – Indian food through Italian. 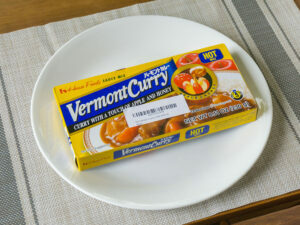 These Japanese curry cubes are a great pick from Amazon.com. Shelf stable until opened they’re an ideal item to have shipped if you live in a smaller town that doesn’t afford you great Asian markets. The cubes are handy to have on standby to make a rich and luscious Japanese curry – which has a variety of uses. Just check the link above to see some of the dishes and uses for these curry cubes. Mae Ploy is one of the most familiar Thai ingredient names out there – and they don’t disappoint with their range of curry sauces. Sure you can make your own from scratch – with time and patience – but why should you? 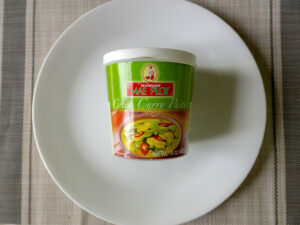 This green curry paste from Mae Ploy keeps forever in the fridge (but ships shelf stable till open) and is a perfect stand in for when you want to make diner in a hurry.